I’m a forty-something wife (of Jeff) and mother (of Christine & Lisa). Jeff & I both grew up in Brisbane, Queensland, only a few miles from each other; we met in 1983 and married in 1987, and we have lived just outside Brisbane for the past ten years, on five acres of peaceful gum-treed land. With business interests in Brisbane, and a home we love, we are likely to remain here in Brisbane for the rest of our lives. Not as adventurous as our migratory forebears! 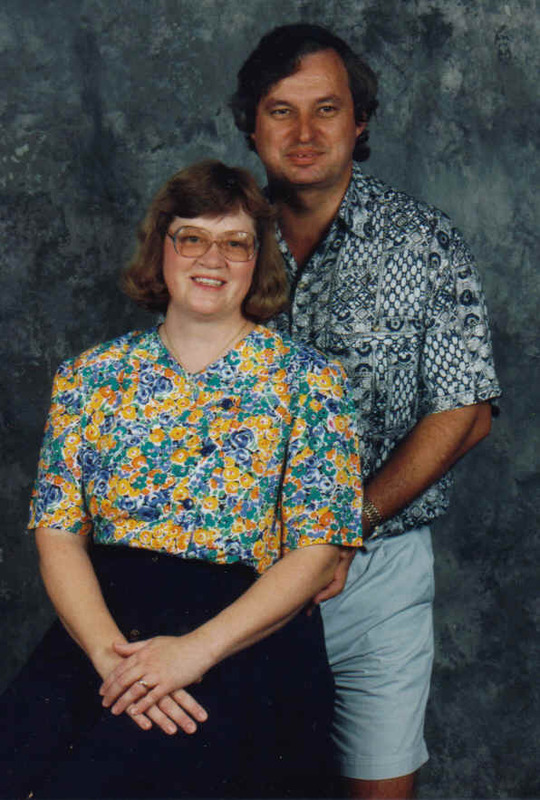 Photo: Sue & Jeff Osborne, mid 1990s. After thoroughly enjoying school (mostly! ), I took a course in Medical Laboratory Science from the Queensland University of Technology which, when I graduated, saw me working in labs in hospitals & private practice as far west as Charleville, Queensland, and as far south as Coffs Harbour, New South Wales. I really enjoyed the investigative work involved in a medical laboratory, but after my two children arrived, I gave up this career to look after them, eventually playing a fuller role in our family Printing business. Now the only investigative work I do is family history, and it makes a nice change from the pen-pushing and paper-shuffling I do part-time, five days a week. I’ve had a penfriend named Sandra in Milwaukee, Wisconsin, since I was 15 and she 16 years old. We have now graduated to emails to correspond after years of using the postal service. We have never met, but found some coincidences in our lives over the years. We both had our first child in 1988; we both drove a blue Corolla, and we both have the same (rare) blood group, to name a few. One of these days one of us will travel to meet the other – or maybe we’ll meet in the middle somewhere! I’m a big fan of Pierce Brosnan; and also love the X-Files (or I used to until Mulder left – not sure now). My daughter Lisa & I both love collecting Barbie dolls; she plays with hers but mine are still in boxes waiting for that magical day when we buy a display cabinet for them. When Lisa grows out of Barbie, then all hers are ear-marked for my collection. I like the character Barbies such as the X-Files Mulder & Scully, the Elvis, the Cher, the Jeannie (from I Dream of Jeannie), Snow White, as well as the dolls from around the world. Other than that, I spend most of my spare time transcribing records and writing letters. Jeff & I have been privileged to have been associated with Albany Fair, our All Saints Parish & School’s Fete, since 1991, its second year. This event, held on the first Sunday in June each year, grows bigger and bigger. In 2002 it won the Australia Day award for the Community Event of the Year in our Pine Rivers Shire. It is a massive undertaking by a dedicated band of volunteers, but an incredibly rewarding experience. During my childrens’ early years I was too busy making family history to be researching it. I used to do a lot of craft work – especially cross-stitching, and Jeff & I both helped run our School Fete for several years- a job which kept me busy for four months of the year. However my Mum, a keen genealogist for many years, kept throwing me snippets of family information, and eventually got me hooked. As she had “our” side of the family well covered, I decided to research Jeff’s Osborne side. Through some initial work done by my Mum, I found the placename “Merriott” on the marriage certificate of our first Queensland emigrant, Samuel Osborne, and I was off & running. An enquiry to Peter Scott, listed in the GRD [Genealogical Research Directory] as being interested in the Osbornes of Merriott, resulted in a major breakthrough in the search, and the confidence to start English research. The other surnames in Jeff’s ancestry include HOWARD (from Cork, Ireland), O’BRIEN (from Armagh, Ireland); HARTEN (from Cavan, Ireland); WEATHERILL (from Yorkshire); and PAYNE & KENDRICK (from Birtsmorten, Worcestershire). All arrived in Queensland in the mid to late 19th Century. My own surname is FARMER (from London, 1884); other ancestral surnames include SANDERCOCK (Cardinham, Cornwall); COX & PLATER (London); LIND (Norway, originally Denmark); GARLAND (Fife, Scotland); and MULLER (Germany). All arrived in Queensland in the mid to late 19th century. As you can see, Jeff & I are blessed with a multitude of lines to investigate, and, with families being researched to the nth degree, have found two separate connections in our hundred and fifty year old Queensland trees, in addition to our own marriage. The other genealogy I find fascinating is the immigration of colonists to Queensland from the United Kingdom and Ireland during the 19th century. All my own as well as Jeff’s ancestors migrated to Queensland between the 1850s and the 1890s, making us both 5th generation Queenslanders. Jeff’s O’BRIEN ancestors came from Ireland on the Queen of the Colonies voyage of 1863. Click on this link to go to my Queen of the Colonies page. At the end of March, 2002, we decided to enhance our lives with a new puppy. Toby is our Labrador-Golden Retriever cross and we who never have had a dog are now hooked! He has been a wonderful happy addition to our family. At the end of 2003 we got ourselves an additional dog – this time a 9 month old Labrador named Simba. We nicknamed her “Rabbit” as she had a strange habit of jumping up and down on the spot. She adored Toby, but Toby wasn’t so sure a lot of the time. She just couldn’t sit still. For some reason she was small in stature (weighed 20 kg to Toby’s 35). At one stage we would often get phone calls at work from kind people in the neighbourhood who said “We’ve found your dogs”. Oh what a sinking feeling. Toby would break a hole in the fencing and get out. Wherever he went, Simba would follow. We would mend the fence and they’d find another way out. In the end we kept Toby in the house during the day, with Simba on the verandah. Toby could jump the verandah gate, you see. Simba couldn’t. Toby could control himself indoors. Simba couldn’t. It’s probably time for an update. All the above was written in 2003. A few things have changed! I’m now the wrong side of 55, Jeff’s hair is a bit whiter (mine of course hasn’t changed – what a miracle!). The girls are in their 20s – one is married – and our little puppy Toby will be 14 in early 2016. We lost our little Simba to a very quick onset of Lung Cancer when she was 10. We haven’t moved home (they will have to carry us out of here in boxes). Our youngest daughter is not into Barbies so much any more, and mine are still sitting in boxes waiting for a cabinet. I’ve rediscovered cross-stitch after not touching it for about 10 years (thank goodness I’m a hoarder and never throw things out – I had a lovely time opening that box and going through things. Half-finished pieces of work, here I come!). We have retired from Albany Fair a long time ago. I run hot and cold on genealogy. Sometimes I seem to do nothing else, but more often I am on a break from it. It mustn’t ever become a chore – that’s not what a hobby is about. I have more time for hobbies now – we have a bus business these days and although it is 24/7 as we run the office from home, it is mostly Jeff doing the work. I’ve had arthritis, mainly in fingers, knees and toes, for about 10 years, and tire quickly with physical work. So I get lots of rest time to indulge in reading, puzzles, craft etc. Maybe a bit of genealogy! It is also nice to have the time to take my elderly parents to the shops and be available for the girls should they need me. A very different sort of life from the one I was leading in 2003. I still feel a bit guilty that I have so much free time (even if I’m listening out for the phone ready to jump into business mode). The guilt is expunged a little bit when I’ve done a couple of hours cleaning buses or a couple of hours doing the tax return. Then I’m free to do a bit of op-shopping, which is my new interest. The things you can pick up for next to nothing! I’ve gotten some lovely glassware, china, dvds and books. The things people donate! I find it fascinating and enjoy it much more than regular shopping. And we still haven’t visited Merriott in the flesh. We were never able to leave our printing business for that long, and now we are developing this new business – well it is never a good time. I just hope that we won’t run out of physical capability to travel. Some of you will be wondering what has happened to this website. Alas I’ve had to change from using FrontPage to using Wordpress. FrontPage was so easy to use, but I’ve decided it is not beyond me to learn a new program. I’ve had professionals transfer all 192 pages to Wordpress but I need to do a fair bit of tinkering to get it all looking the way I want. Bear with me please! Shortly after I updated last time (November 2015) my dear Mum fell ill and died of mesothelioma, all in about 10 weeks. It was an awful time and her loss still hits me when I least expect it. I have inherited so much genealogy stuff – books and papers and media. Should keep me going a long long time. 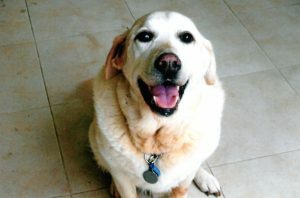 Shortly after Mum died, our 14 year old puppy Toby also passed away. He had a brain seizure and it was all over in a couple of hours. We often speak of the joy he brought us with his little quirks and his peacefulness and his smiles!